Heres my opinon on sk8 equipment. 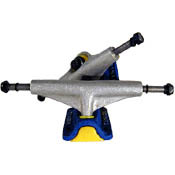 Tensor Trucks:These trucks are awesome,they are especialy good for people who like to nose slide,and blunt slide.They are durable and cheap.Gotta get em'. Black panther bearings:I think these bearing are great but,they wore down fast due to dirt and resadue getting in the bearings.There good while they last though. Unit sk8 wax:When you go to a skate store you canm buy either the concrete made waz or the metal made wax.I bought both, and they work great.There cheap too.They last for a while.I would say a weekly waxing of your board and a weekly waxing of a ledge or something,the wax should last for about 3 months. Tell me what you think,email me.Go to the contact me page and email me, i might post up what you put!